Sector 9 longboards are well known for being some of the best longboards in the market. 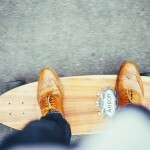 They are made of high quality materials and excel in all types of longboards. Whether a rider is interested in a cruising board or a downhill board, they can rest assured that there are sector 9 longboards in the market that meets their requirements. These high quality longboards are used by both professionals and beginners because of their great performance, great design, cutting-edge technology and being of some of the highest quality longboards available. 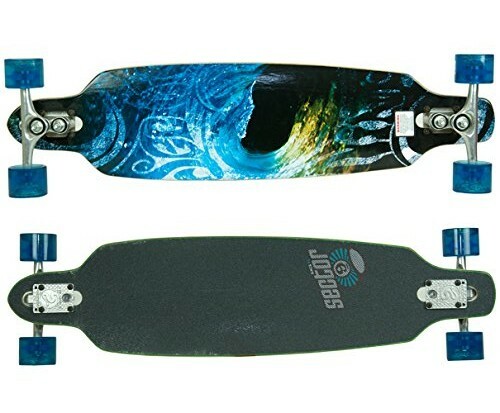 Sector 9 longboards come in different divisions and series which vary significantly. This ensures that no matter the preferences, riding style or requirements of a rider, they are different Sector 9 longboards that meets their needs. Below are some of the divisions and series available from Sector 9. The Downhill Division Series sector 9 longboards are designed for stability and the sharp turning needed for downhill racing. They feature 9-ply maple decks for medium flex as well as maximum strength and durability. The boards come with CNC wheel wells to prevent wheel bite and to provide more adjustability of the wheelbase. For better racing, the sector 9 Downhill Division Series longboards come with Race Formula Offset wheels. The sector 9 Sidewinder Series longboards are designed with carving, sharp turning and some sliding in mind. The decks are designed to be used easily with Gullwing Sidewinder trucks which feature two kingpins. This increases the rider’s ability to make sharp turns and increase speed while turning. This makes the Sector 9 Sindwinder Series longboards especially well-suited to carving. The Sector 9 Platinum Series longboards are among the best in the market and that Sector 9 has to offer. The Platinum Series longboards are meant to be the best for the riding style they were designed for. Options included are cruising, carving, sliding and freeriding. The one thing they all have in common is that they do what they were meant to do extremely well. They all feature high quality and greatly designed decks as well as being made of top-of-the-line components. There are many other great Sector 9 divisions and series meant to cater for different types of riders. They include the Sector 9 Bamboo Series, Sector 9 Glow Series, Sector 9 Artist Series and the Sector 9 Slide Series. Given the great variety, amazing performance and the high quality of sector 9 boards, selecting the best is no easy task. Listed below are the top 5 Sector 9 longboards that are without a doubt among the best longboards one can get on the market. Sector 9 offers a variety of styles and designs. There are many Sector 9 longboards that are perfect for certain riders. The top 5 have been selected in an effort aimed at selecting the top 5 Sector 9 longboards for different riding styles and diverse riders. The top 5 Sector 9 longboards lists also tries to cover some of the best boards in different divisions though by no means comprehensively. 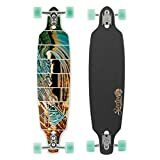 The Sector 9 Blue Wave Lookout Longboard is one of the best boards from the Sector 9 Bamboo Series and is rated as most as one of the best sector 9 longboards around. It is also one of the best all-around longboards in the market. The board’s 5-ply laminated Bamboo deck measures 42 inches in length and has a width of 9.6 inches. The deck features a W-concave and clear 3200 Jessup grip tape covers all the board’s surface head to tail. The drop-through mounted deck rests on 10-inch Gullwing Chargers trucks. These connect to the 74mm Sector 9 top-shelf wheels with a durometer rating of 78A via PDP ABEC 5 bearings. 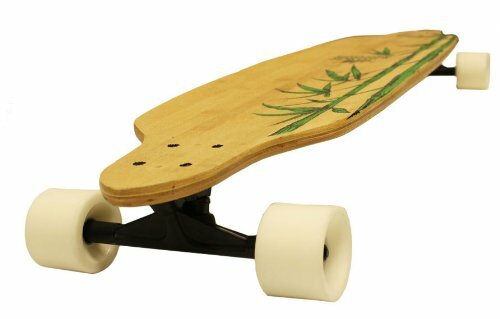 Being made of bamboo makes the board light and flexible. The drop-through design keeps the centre of gravity low, increasing the ease of cruising and riding at high speeds. The W-concave and having grip tape all over the board further enhances a rider’s stability and safety. It is a smooth riding longboard even when riding at high speeds. The overall design of the board makes it great for cruising, carving, sliding and downhill riding. The Sector 9 Aperture Sidewinder Drop Through Downhill Cruiser Freeride Longboard is meant to be a great longboard for any type of rider. The 8-ply maple deck measures 36 inches in length and 9 inches in width and has a wheelbase of 26.4 inches. The drop-through mounted deck rests on Gullwing Sidewinder trucks perfect for speed and sharp turning. These connect 69mm wheels with a durometer rating of 80A via ABEC 5 bearings. The Sector 9 aperture Sidewinder Longboard is another great all-around board from Sector 9. The drop-through mounting design lowers the centre of gravity of the board. Combined with the trucks that come with the board, this is one highly stable and manoeuvrable board. The board is light and accelerates very fast. The board performs well as a freeride board. It is an amazing board for cruising, carving and bombing hills that are not too steep. The Fractal Sidewinder Longboard is one of the best carving longboards ever made. The 8-ply maple deck measures 36 inches in length and 9 inches in width. The drop-through mounted deck rests on 9-inch Gullwing Sidewinder II trucks. The board features CNC wheel wells to accommodate larger wheels. The wheels are connected via PDP ABEC 5 bearings. The maple deck provides just the appropriate flex to make this board great for carving. The drop-through mounting lowers the centre of gravity which makes the board more stable during turns. The double action pivot provided by the trucks enables a rider to use their own momentum during turns to accelerate. The Fractal Sidewinder has the design and high-quality components to make it a good board for all types of riding. However, this was a board that was meant with turning in mind. This makes it one of the best boards out there for carving. The Sector 9 Dropper Longboard is a Platinum Series longboard designed for sliding. The 8-ply maple deck measures 42 inches in length and 9.6 inches in width and has a wheelbase of 29 inches. The drop-through mounted deck rests on 10 inch Gullwing Charger trucks. These connect 70mm Butterball Slide wheels with a durometer rating of 80A via PDP ABEC 5 bearings. 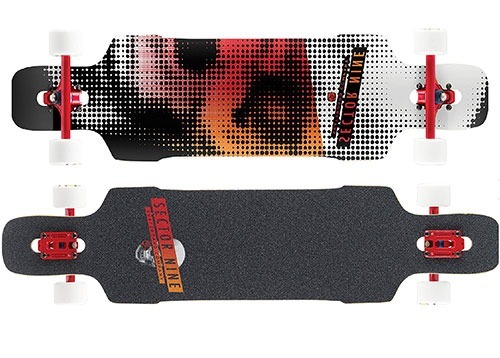 The deck features a small concave, clear 3200 Jessup grip tape covering all the board and CNC wheel wells to prevent wheel bite. The drop-through mounting of the deck lowers the centre of gravity for better stability. The trucks make it easy to initiate slides as do the board’s Butterball wheels. The board’s concave and grip tape ensures that a rider is well anchored to the board for increased safety and stability. Everything about this board is designed to make it a great and easy to use sliding longboard. The Sector 9 Bomber Complete Longboard belongs to the Sector 9 Downhill Division longboards. The board is made of 3-ply maple and 4-ply fibreglass. It measures 37 inches in length and 9.75 inches in width with a wheelbase of 30.5 inches. The deck features a deep concave, wheel cutouts and black Jess grip tape. The 10.0″ Gullwing Charger II Trucks connect the 70mm 82a Offset Race Formula Wheels. The trucks make the board maneuverable, making turning and sliding with the board easy. This is one of the greatest longboards for downhill riding and bombing hills. The boards covered in the article are some of the best boards from one of the best known brands and maker of great longboards. They each excel and are designed for certain styles of riding. 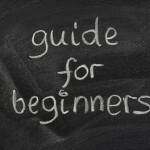 This makes them use and thus well-suited to beginners. They are also highly specialized and use quality parts. This makes them ideal for experienced riders looking for a great board for certain types of riding. Whichever of the top 5 Sector 9 longboards listed here a rider chooses to go with, they can rest assured of one thing. They are getting one of the best boards in the market and are in for a great and fun riding experience.